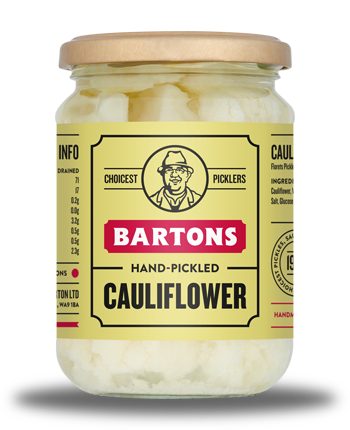 Bartons Pickled Cauliflower in Vinegar is a pickled vegetable consisting of cauliflower florets, pickled and preserved in vinegar and salt. Bartons Pickled Cauliflower in Vinegar is a pickled vegetable consisting of cauliflower florets, pickled and preserved in vinegar and salt. Pickled Cauliflower is often eaten alongside Salads and Sandwiches or as part of a Pub ploughman’s lunch. Great added to a mixed or potato salad to add a tangy bite. Vegetables in variable proportions (cauliflower (contains sulphites), onions), water, acetic acid, spirit vinegar, salt, glucose syrup.